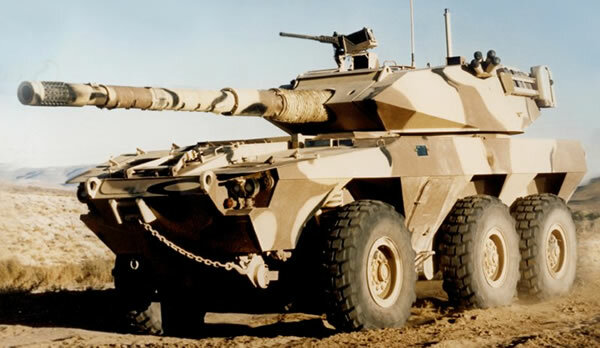 The US LAV-600 6×6 Fighting Vehicle is an improved version of the earlier Cadillac Cage LAV-300 6×6, which had been exported to Kuwait, Panama and the Philippines, the later being the only country to still use them. The first prototype of the LAV-600 was built in 1985 under the designation LAV-300 A1, but in 1986 it was re-designated the LAV-600. Development finished some time after 1988. Standard – The vehicle hull is built from steel that provides protection against 7.62mm Machine Gun fire and artillery splinter shells. The vehicle has x8 smoke grenade launchers mounted on the turret for laying a smoke screen. Optional – NBC filtration system for the crew, run flat tyres as well as appliqué steal plates for additional protection against larger calibre MG fire. A Halon fire detection and suppression system. The turret is the same as the one used on the Stingray I light tank and houses a 105mm rifled main gun an coaxial 7.62mm MG as well as a 7.62mm MG mounted on the commanders cupola. The vehicle has a computerised Fire Control System and gunners laser designator. The turret houses the gunner, commander and operator. It has a full 360 degree traverse. The powerpack is a turbocharged 275hp Cummings 6CTA 8.3 diesel engine and an Allison fully automatic transmission with six forward gears. The LAV-600 is designed to allow it to be air-transported using C-5 Galaxy, C-141 Starlifter, C-17 Globemaster III and C-130 Hercules aircraft. The vehicle is reportedly been exported to Thailand and Philippines. Despite its name “LAV” this vehicle is not a member of the GDLS Canada’s LAV family. It was developed by US Firm Cadillac Cage as a private project for the export market.